The Metropolitan Museum of Art in New York just closed an exhibit on superhero costumes. 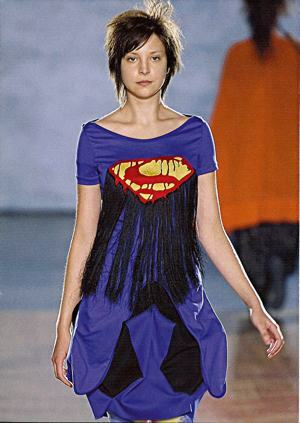 Sponsored by their Costume Institute, the show featured clothes by fashion designers that appeared to be influenced by superhero comics and movies. 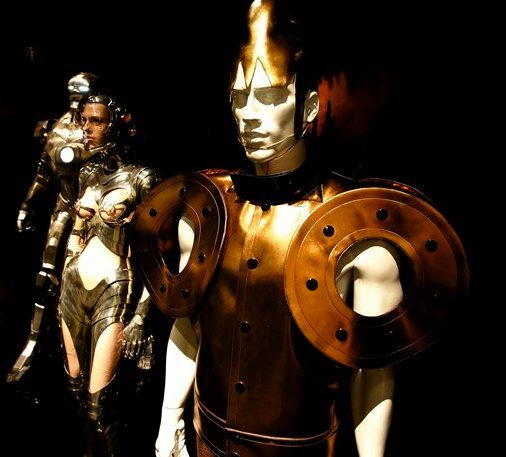 These amazing concoctions stood alongside authentic costumes from the movies and real sportswear that evoked superhero bodysuits. The show was visually fascinating even if the text was a bit heavy-handed (even I, a true believer in metaphor, would not use it as often and as generically as they did). The exhibit was accompanied by a beautiful catalog which had a metal cover and thick, glossy pages (sponsored by designer Giorgio Armani and Condé Nast publications). In the catalog is an essay by American writer Michael Chabon who makes the proposal, or actually, states a “fundamental truth,” that a superhero costume is “an impossible object” (p. 17). By this he means that the costumes real essence is that it belongs on the pages of a comic and cannot, maybe should not, ever become a reality. This is an interesting concept except he loads the proof for this on the back of the costumed fans who attend comic book and fan conventions. He states, “Even those costumed conventioneers who go all out, working year round to amass, scrounge, or counterfeit cleverly the materials required to put together, with glue gun, soldering iron, makeup, needle and thread, an accurate Black Canary or Ant-Man costume, find themselves prey to forces, implacable as gravity, of tawdriness, gimcrackery, and unwitting self-ridicule” (pp.17-18). I couldn’t disagree with him more. From an anthropological perspective, this costuming is a fabulous ritual, a way for participant to be more than observers, to be part of the show and to experience it in a way that is far from tawdry or ridiculous. For anthropologists, participating in this ritual event of entering another universe and acting out its inhabitants through makeup, costumes and altered mindsets is the essence of what we as humans do. We may not be superheroes everyday, but enacting some part of their (albeit fictional) lives and more importantly interacting with other con goers as if they were the character their handmade and lovingly constructed costumes depict is a priceless sight to behold. Every costumed person at Comic-Con was stopped for photographs (and I never saw one refuse or complain) as they made their way through thousands of people. They provided something else too that directly contradicts Chabon: their costumed bodies were actually proof that maybe, just maybe, because we could see and hear and feel them among us, maybe the superheroes they enact really can come true. I met Davy Jones and Indiana Jones and Hermione Granger, stormtroopers and ghostbusters and Pokemon trainers. 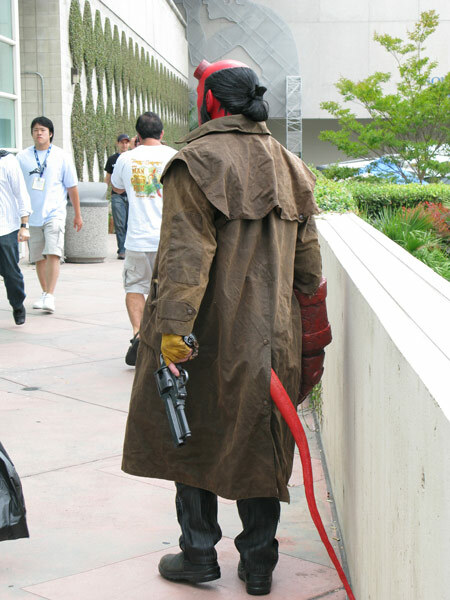 I chased down Hellboy for a picture then saw him stopped endless times by endless fans as he walked among us, on our cell phones and eating lunch and dragging our kids. He sure looked real to me and to them and he gave us a real experience of what it is like not to be cynical and stuck in the all too real world where the only real superhero is one fashioned by a professional clothes designer.